After the introduction of vegetables, fruits and cereals, it is time to put a little meat to baby menus. 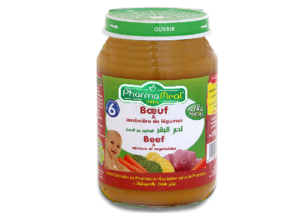 Your baby will enjoy this little beef dish cooked with vegetables that will bring him all the nutritional values he needs to grow well. Our vegetables and meats are 100% natural and 100% HALAL, and are specially selected by rigorous controls. Packaging : small jar of 200g. Warm in microwave or double boiler. Check the temperature before serving to the baby.